Willard Reservoir Willard Reservoir is in Huron County. This lake covers 215 acres of fishing water and has 2.3 miles of shoreline. This lake is in Ohio Division of Wildlife District Two(2). 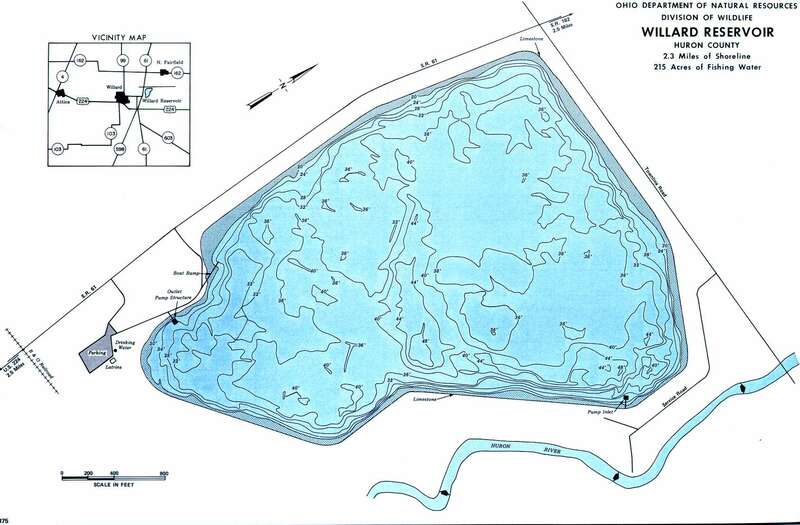 Location Willard Reservoir is located in southwest Huron County on State Route 61. It is approximately two miles north of New Haven in New Haven Township. Distance from Major Cities Approximately 60 miles southwest of Cleveland. Approximately 70 miles southeast of Toledo. Approximately 25 miles south of Sandusky. Fishing Opportunities Willard Reservoir contains; *Largemouth Bass *Bluegill *Yellow Perch *Walleye *Brown Bullhead. *Channel Catfish stocked by the Ohio Division of Wildlife. Natural populations of *Rock Bass *Green Sunfish *Suckers and *Carp have migrated in from the Huron River. Boating Information There is an electric motors only restriction on this small reservoir. A modern boat launch is located at the south end of the lake off of State Route 61. State Management The Division of Wildlife activities include ~ monitoring fish populations ~ physical and chemical water quality analysis.